In a competition or race, people challenge each other to test who is the fastest, can score the most points, endure the longest, outwit the others, is the most popular, has the most followers, gets the most votes, or is the best ___ (fill in the blank). These popular competitions assume that only one person or team can be the best at whatever contest is at hand. After the race, the good contender receives the bronze medal, the better gets the silver medal, and the best is awarded the most precious gold medal. In rare situations there is a tie, resulting in two winners sharing the same ranking and each receiving that rank’s medal. But what if one person or team could win first, second and third place? Is this possible? “Good, better, best. Never let it rest. ‘Til your good is better and your better is best.” I first recall this famous quote as an elementary school student in Sister Mary Lamont’s second or third grade English class. I had fun learning and repeating it with my friends because of the sing-song rhyme. It was also a positive motivator. And one of those sayings that gets stuck in your head so that years later, like now, I still recall it. The quote is attributed to St. Jerome, born in 347 A.D., who is best known for translating the Bible from Hebrew to Latin and for his many other writings. And in case you didn’t know this (I didn’t), he is also recognized by the Roman Catholic Church as the patron saint of translators, librarians and encyclopedists. So although competitions with others are important and help us to grow and improve, you can win all of the most precious prizes by competing with yourself and truly aiming and doing your very best. This painting, Precious Metals, uses gold, silver and bronze pigmented wax and was inspired by a dream – close to the time of the Sochi Winter Olympics – in which one person in a race impossibly finished first, second and third! Now how on Earth could this be? Now you know. Here’s a groovin’ tune to brighten your day, Good Better Best music video by Y’akoto. How do you get motivated to do your best? ⇒ For information about commissioning a similar piece, contact Janet Fox. It’s summer time. The hot, sunny weather beckons us to the fountains, swimming pools and seaside beaches to submerge ourselves to keep cool. Sometimes while in the water, something submerged catches our curious eyes and beckons us under the surface to take a closer look and maybe to pick it up. The view through open eyes while under the water is quite different than through the air. With the water’s substance and lower levels of light, things can look quite fuzzy and solid objects can seem to ripple. Distances can seem harder to estimate and it may take a few tries when reaching out to pick up something. If you poke around my site, you’ll see that many of my paintings have themes near or in the water. There are many ideas and articles about the significance of water in dreams. Psychotherapist and author Jeffrey Sumber, M.A., M.T.S., L.C.P.C.’s blog is a good place to start. What is it, there, under the surface, that is obscured from above and calling me to descend to explore? 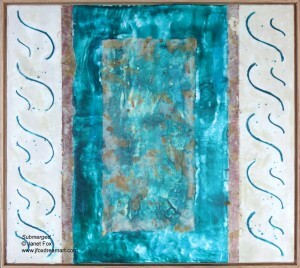 Can you see what is submerged in my painting above, captured and just beyond a clear view? Some explorers, like Fabien Cousteau and the Mission 31 team, push the envelope with record-setting submersion. Did you know? The Olympic torch not only traveled to the International Space Station, it was submerged-and stayed lit-in the world’s deepest lake in Russia ahead of the 2014 Sochi Winter Games. What do you find when you look through and under the surface? 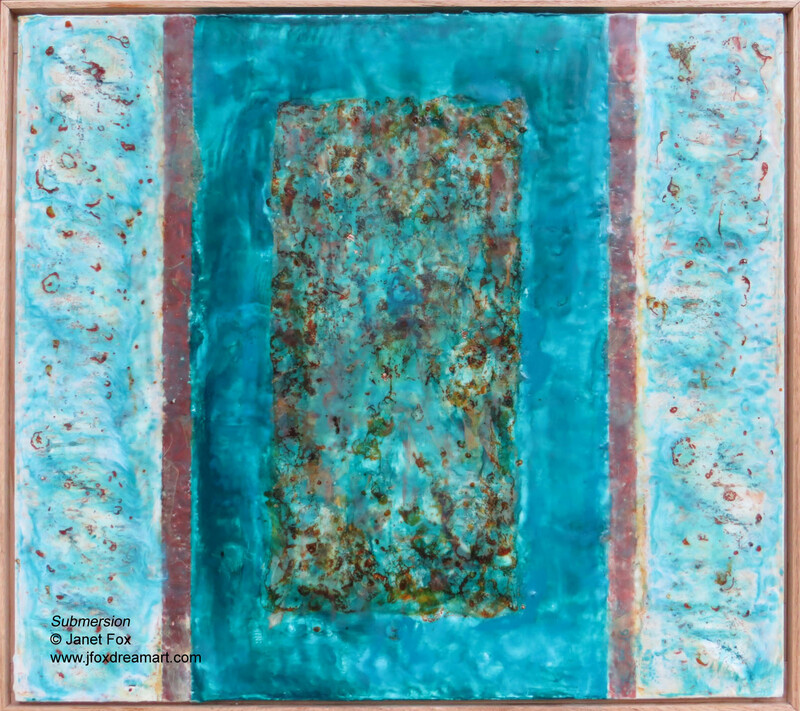 ⇒ For information about purchasing this artwork, contact Janet Fox. This painting, previously known as “Submerged,” was refined in June 2016. My encaustic painting, Chapel Glass, was inspired by the beautiful stained glass window in the former chapel in the center of the grounds at the Congressional Cemetery in Washington, D.C. I visited the historic cemetery in late winter in preparation for the “Back to Life” art exhibition in April 2014. I was drawn to the building and its windows, wondering who and how many others had gazed through the glass over the years. The reason for this is… when the cemetery was first established in 1807, it was chosen by the United States as the place of interment for nearly every member of Congress or executive officer who died while holding office, and the custom was adhered to by the Government for many years afterward.” For more details, the History link on the Congressional Cemetery’s website is the place to go. 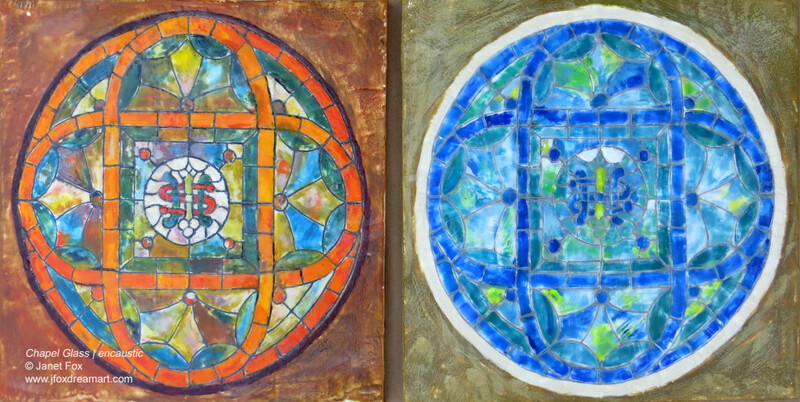 I first painted the panel shown above on the right, based on my notes and a photo I took while on the grounds. This exterior view includes layers of blue and green hues, with touches of yellows and white. Then, while unsuccessfully researching to find the original artist, date, and name of the window, I discovered a surprisingly different view. It is the left panel as seen from inside the chapel. With sunshine streaming through the glass, it displays lively yellows and oranges, with speckles of pink, white and light blue. Perhaps to someone attending a loved one’s funeral, this brighter view brought some rays of comfort. These views also became a metaphor for the things, people, arguments and situations that change depending on the viewers’ illumination, mindset and vantage point. And close-ups look different than broader perspectives from far away. I suspect the members of Congress buried there expressed many different and colorful thoughts, ideas, opinions and positions during their lives and times in office, too. Kathryn Vercillo explores optical illusions… two faces or a vase? old or young woman? “It’s a mighty thin pancake that don’t have two sides,” is a phrase Rex Early, an Indiana political analyst, would say frequently on the “Indiana Week in Review” radio program. He wrote a book by the same title. What reminds you that you can see something many different ways?